The inspired—and often unexpected—results when architects create. We present to you 21 stories on style, site, and sustainability. On the following pages you will find 21 examples of what happens when architects consider their client’s style, how they live or work, the site, and the environment. 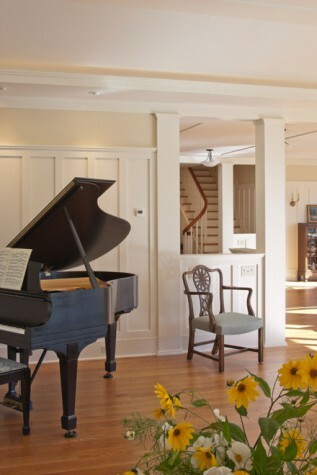 You will witness the essence of the owner’s vision for each space and the interpretation of it through the imaginations of Maine’s leading architects. Each year we find ourselves awed by the design being created in our state—the use of unexpected materials, structures situated on sites that make one realize there is no better spot, and interior flows that are as planned as they are organic. The 21 projects highlighted in this issue were chosen not only because of the beauty of their designs, the meticulous craftsmanship with which they were built, and their impressive energy efficiencies, but also because each one demonstrates how, when the relationship between owner and architect is a solid one, incredible things happen. A crisp, contemporary home that sits comfortably among its neighbors. To capitalize on the harbor views, the living room was placed on the second floor and given a private deck. The master bedroom sits opposite, looking across to the living room fireplace. Downstairs, the crisp, minimal design of the kitchen allows a dining table and artwork to dominate the space. Traditional elements are rendered in an austere palette of white-on-white exterior finishes, charcoal gray roofing, stainless-steel accents, and cable railings, simultaneously embracing the residence’s historical context and its contemporary reincarnation. The entire interior is clothed in vertical flat boards that are detailed with consistent, intentional gaps. Door hardware is either blind or omitted. The theme of boards-with-gaps extends to include the cabinetry. A recessed slot paralleling the ascent of the stairs creates a reticent handrail. A frameless sheet of tempered glass guards the second-floor stairwell. Ash boards washed with translucent white were used as flooring throughout the home. An absence of baseboards, casings, and trim provides a calm backdrop for the owner’s collection of antiques and artwork. Solar collectors fitted to a pitched roof contribute to responsible energy use. And high R-value sprayed-foam insulation, argon-filled low-e glazing, high-efficiency heating apparatus, and low-wattage lighting minimize energy consumption. 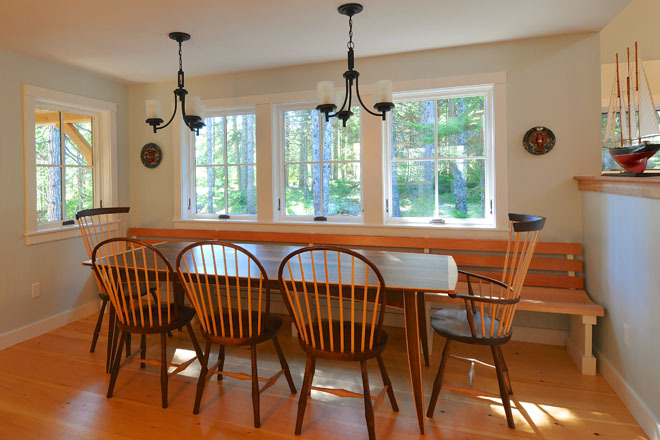 Locally sourced woods lower the carbon footprint, and the windows gather passive solar heat. Overall, the compact, disciplined plan addresses sustainability goals. 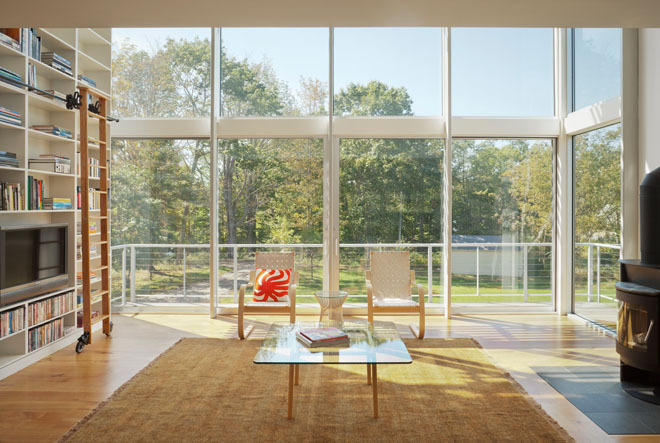 A small house and artist’s studio takes advantage of a magnificent site on Mere Point. Originally designed as a guesthouse and artist’s studio, this home was built on the foundation of an existing garage. The project brief included a future house closer to the water, but for the moment the guesthouse and studio function as the primary residence. The ground level of the building remains a garage, while the living spaces occupy three floors above. On the first level, a kitchen and dining space is positioned under a second-floor loft, alongside a two-story living space that makes the compact house feel much larger. In the sleeping loft, a west-facing bay window frames views to the water. On the third level, half of the floor plan is studio space while the other half is a rooftop deck. The only addition to the existing footprint is a stairwell that was glazed on the south face to provide passive heat and, more important, to bring natural light to each floor. Located at 44 degrees north latitude, south-facing windows take advantage of passive solar gain in the winter and are appropriately screened for the summer months. The photovoltaic panels on the roof provide more than enough electricity for the energy-conscious house, and excess production is sent to the grid. The solar hot-water system provides an adequate supply of domestic hot water and backs up an in-floor radiant-heating system. An air recovery system provides ventilation. The reuse of the existing foundation was primarily a conservation decision. Building materials were sourced locally, and no toxic substances were used. The landscape design sought to mitigate the previous owner’s impact on the property, and now it contains very little impervious surface apart from the house. The landscape and siting leave views to the water open for all. 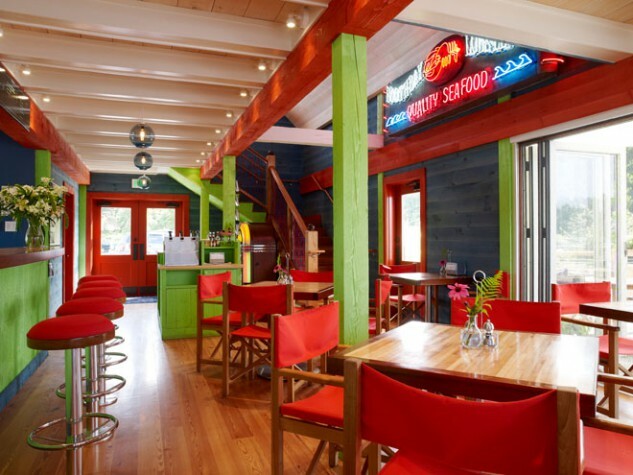 An 1800s barn converted into a colorful seaside restaurant displays a blend of salvaged and modern finishes. E.W. Pratt General Store and Merchandise was started by Gus Pratt and his wife Emolyn in 1948. Many years later, the store had closed and the building had fallen into disrepair—that is, until a generous benefactor and Cozy Harbor resident decided to bring it back to life. The original barn underwent a major renovation. Several old additions, including one that had housed a bowling alley, were demolished to make room for a new commercial pier. Today, Oliver’s restaurant maintains a classic historic charm—a red-roofed barn, white clapboards, and traditional six-over-one windows. The interior styling is a nod to the harborside setting, including a fresh, colorful palette: blue walls, teak furniture, a red-and-blue rope mesh on the stairs. Working with such a small space was a challenge overcome by keeping the floor plan open with uninterrupted sight lines. The kitchen theater can be enjoyed from the long sweeping bar, which was created from the old bowling-alley floor. Accordion-style doors let the walls disappear, exposing a panoramic view of the harbor. Tables flow from inside the restaurant to the outside pier. Upstairs, a loft with a railing dotted with old bowling balls leads to an open-air deck carved out under the gable—a high perch from which customers can watch the sailing school in Cozy Harbor. For the benefactor-turned-proprietor, Oliver’s is everything he dreamed of: a meeting place where the community can gather to share food, drinks, and conversation—just as they did at the general store 64 years ago. A house for everywhere makes its own unique place. This house answered the challenge of a design for both young families and empty nesters. The project grew out of a series of designs executed for a developer. The plans were compact, efficient, oriented for solar exposure, adaptable to a variety of sites, and accompanied by a menu of options. All had a master bedroom on the first floor and a single spacious living area. The client for this house was an empty nester. Like many sites in Maine, it’s near the water but in the woods, and the surrounding summer community has a long tradition of understated, unpretentious living. Not unexpectedly, the prototype design evolved. Add-ons include a fourth bedroom for grown-up children who come to visit and a screened porch high in the trees. True to the original concept, the house is nestled into the site and has maximum solar exposure. After a major windstorm blew down surrounding trees, a garden of indigenous grasses and shrubs—all carefully planned to look almost, but not quite, natural—was added. Materials are modest: Sheetrock walls, pickled-pine trim, and fir ceilings, posts, beams, and cabinets in the large room. The architect designed most of the light fixtures and a standing lamp, but a family member designed the large driftwood sculpture above the fireplace. Patterns of the setting sun and the owners’ boat are cut into the shingles at the gable ends. Compact and efficient, the house provides single-story living and was relatively economical to build—but it’s not a development home. The desire and the need to customize are always present. The design is a unique response to a particular site and to the family who lives on it. A bright, energy-efficient beach house built on a tight budget can be enjoyed year-round. This modest, cobbled-together 1800s cottage on Willard Beach was gutted, fit out with comprehensive systems, and built to meet LEED-certification standards. Zoning limited substantive alterations to the envelope except for the addition of a garage in the rear. Collaborating architect Frankie Elmquist led LEED for Homes certification coordination as well as initial planning and design. Winkelman led shell development and a comprehensive interior package. The highly creative and artistic clients set the tone for a refined, inventive approach to evolving the spaces. Finessing the interrelationship of the open plan’s restricted living/dining/kitchen configuration posed some challenges. The kitchen peninsula’s distinctive form, which came to be called “the canoe,” is made of curved native walnut and reflects a deliberate layering of space. In addition, thoughtfully articulated ceilings and carefully placed lighting help reinforce spatial definition while allowing expansive and uninterrupted views to the dunes and water. The finely crafted interior maximizes the use of every inch of space in a fashion that is similar to that of a classic, well-considered yacht. This creative use of space as well as quality materials lend a nautical air to this beach house’s style. The home earned an Energy Star label and LEED Gold certification under the U.S. Green Building Council’s LEED for Homes pilot program. A Rumford-style wood-burning fireplace, one of the home’s traditional elements, was carefully customized with a closed air-flow system and seamless glass doors to meet LEED’s strict indoor air-quality and tightness standards. On the shingle-style exterior, deep overhanging eaves, hidden awnings, and a pergola provide solar control. The outcome is that these LEED Gold standards don’t “announce” themselves; instead, the home discretely radiates the quiet charm of a cottage tucked behind the dunes. A multigenerational gathering place for a large family. After passing through the old stone gates of a 1920s estate, the road winds downhill through the trees toward the shore. Dragonfly Lodge sits nestled between the woods and the water, looking south to a view of Blue Hill Bay. A spacious living room open to the second floor above sits in the center of the floor plan. Blueberry fieldstone and granite, harvested from old Blue Hill quarries, and sea-washed bricks were used in the fireplace in the living room. The white-painted wood walls impart a feeling of spaciousness, while the natural-fir finish on the second-floor ceilings adds warmth. The second floor has three bed-and-bath suites. A children’s bunkroom is located adjacent to the parent’s water-view bedroom, providing both privacy and connectivity. The rear suite doubles as an upstairs living space for younger family members to relax. Across the second-story bridge is a bedroom suite that offers the most privacy, as well as views of bay and gardens to the west. Throughout the first floor, oversized glass doors connect the interior to the deck and the gardens beyond. A large stone fire pit refocuses the view toward a private beach to the east. The overhang is continuous around the house, providing extra shelter from the severe coastal weather while at the same time reducing the visual scale of the exterior. The south-facing design contributes solar gain. Closed-cell foam insulation was used throughout the house for maximum R-value, and radiant heating was installed beneath the wide-plank flooring. Located at the edge of a harsh oceanfront environment, this collection of buildings marries the familiar with the unexpected. Three simple cottages linked by a series of decks make up this summer compound that extends over a tidal salt pond at the edge of the ocean. 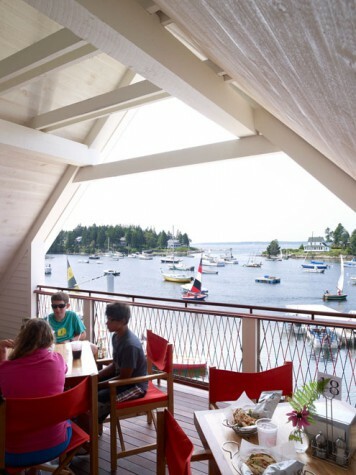 Inspired by the fishing shacks and wharf buildings that dot the coast of Maine, this retreat weaves large, modern sliding-glass panels into a modest, shingled house with New England cottage features, where the contrast of old with surprisingly new is revealed. The small, punched windows on the landward side give way to an open floor plan, and the water-facing walls include large swaths of glass exposing views of the ocean beyond. The interior space is a reflection of the exterior form but with a modern treatment. 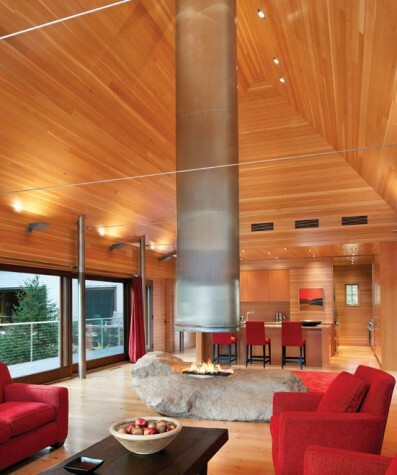 A large granite boulder provides a base for the fireplace, and the stainless-steel-clad flue suspended from the structure above contributes to the lightness of the space. 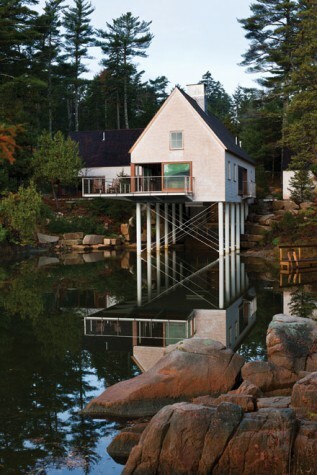 The interior columns transfer the house’s load to a steel frame anchored in the pond’s granite basin—the steel piers that hold the building are an updated version of the wood piers that support traditional wharf buildings. The main wharf cottage contains communal living spaces: kitchen, dining, and living rooms arranged in an open floor plan. A cantilevered deck links the interior space to the environment beyond. The flanking cottages contain private sleeping quarters and frame views to the surrounding moss-covered forest. An eclectic home receives a deep energy retrofit, smaller footprint, and updated interior. Built in the 1970s, the original house had an eclectic character, including a variety of recycled materials and an exposed post-and-beam structure that the owners particularly loved. Yet despite the perfect south-facing orientation, the house provided low thermal comfort and high utility bills. The somewhat gloomy interior had limited views of the surrounding garden, private pond, and fields on the 10-acre property. A separate guesthouse and studio was built in the 1990s, but it was situated far from the main house and it disrupted natural groundwater flow. The client desired a smaller footprint (both literally and environmentally), an updated interior, and a deep energy retrofit to achieve net-zero efficiency without compromising comfort or aesthetics. The architects created a design that reduced the need for space and that combined functions. And by physically moving the entire studio building closer to the main house, drainage was improved and the overall footprint was reduced. The new design comprises a variety of features that capitalize on the natural beauty of the site, including covered porches, new dormers, uncovered terraces, and an energy-producing tower that serves as a workspace or guest bedroom with spectacular views of the meadow and wooded area to the north. The entire exterior was reclad, and four inches of exterior insulation was added. Existing features were shingled, and new features were clad with horizontal or vertical boards to visually distinguish between the old and new. A Maine family camp revisited. Located on the shore of Sebago Lake, Camp Porta Panagia (named after the historic basilica in Pyli, Greece) is nestled in the pine trees, and commands south-facing views of the lake. Although the site had an original camp structure built by the owners’ family, it had deteriorated over the generations and could no longer serve the growing family’s needs. The new design created an open relationship among living spaces, which include a modern kitchen, a dining area that can accommodate 12, a living room with cathedral ceilings and a stone fireplace, and a screened porch and balcony overlooking the lake. The camp also has four bedrooms, an entryway mudroom, recreation room, laundry, and three-and-a-half baths. Although less than 2,900 square feet, the careful use of large south-facing windows and taller ceilings make the spaces feel generous and well proportioned. From the north, the camp maintains a two-story roofline. As the site falls away to the water’s edge, a day-lit basement provides access to a lower terrace. The scale of the three-story façade is balanced by the screened porch, deep overhangs, and white-cedar log columns. Both the exterior and interior materials reflect the site and local camp aesthetic. Although rustic in appearance, the camp integrates low-maintenance, high-efficiency materials and systems. The owners and their family played an active role throughout both the design and construction phases. The involvement of the clients enabled the architects and builder to design and construct a camp that provides a welcoming place for the entire family to enjoy the peaceful lake setting. On a steep Mount Desert Island site, a family’s summer home reflects the warmth of its owners as well as the textures and colors of its surroundings. On a steep ledge in wooded terrain overlooking Frenchman’s Bay, the excited new owners of this property turned to their architect and asked, “So can we build something here?” “Of course,” Kay Stevens-Rosa responded, looking at the road above and out to the breathtaking bay views as her mind raced through the complexities of the challenge. After renting a neighboring cottage for many summers, the family had come to love the place, which was hidden away from the commotion of their everyday urban existence. Months of site studies and digital modeling produced an elegant design that carved the home into the hillside, hugging the natural contours of the land. An inviting terraced stone entrance is naturalized by the deft touch of the landscape architect. The warm cherry trim and white-paneled interior—punctuated by a gallery of treasures found by the family while beachcombing—steps down toward the sea, as it opens to the view along a wall of glass punctuated by skylights, then opens out onto an expansive deck. Windows that strategically frame large boulders, a fireplace made of stones from the site, and the soothing colors of beach pebbles and sea glass create a dialogue between the inside and the outside. What began as a daunting challenge became the project’s most interesting and wonderful feature. 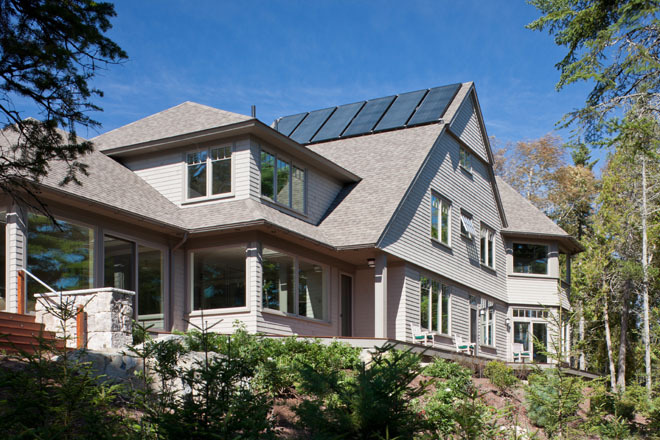 Inspired by the traditional forms of midcoast Maine homes, this house integrates innovative features to capitalize on daylight and views. Located on a 30-acre site, this new classic revival home sits on a high point of land, with sweeping views of the Medomak River through the trees. The client wanted a home that was traditional in style but filled with daylight. His desire to offset the long winters inspired the architects to “borrow light” by incorporating glass-block flooring on the second floor, which allows daylight from specially designed skylight dormers above to flood through to the floor below. “We wanted to bring in light and filter it from above without losing the traditional feel of the house,” says architect Cynthia Wheelock. To accomplish this feat, she and partner Nancy Barba designed “skylight dormers” using Wasco Classic Extended Pyramid Skylights instead of roofing above the dormers. 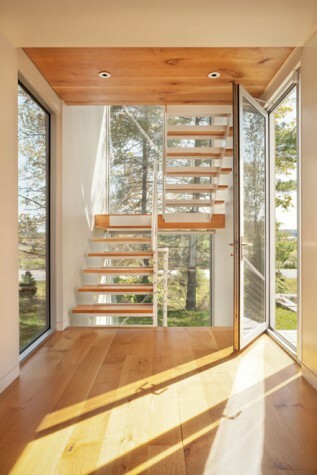 The dormer above the stairwell and the second-floor landing also allows sun to pour through, bathe the glass-block floor on the landing, and then filter through to the foyer below. Elegant formal living spaces dominate the center of the house, bookended on one side by a cozy library that doubles as a guest room and, on the other side, by an English conservatory dining room that provides views of the woods and water beyond. Second-floor bedrooms and baths are flooded with light from the other skylight dormers, and the master bath has a glass shower with a window and view. The kitchen, open to the formal living spaces, is both formal and functional. 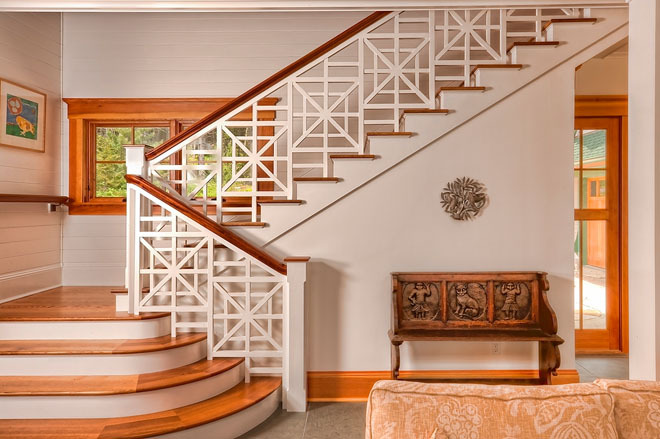 Classic proportions and details highlight rooms unified by reclaimed southern yellow-pine floors throughout. 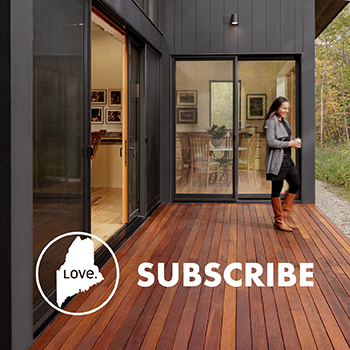 A summer home inserted into a native landscape of trees and ledge on Mount Desert Island. The basic design for this project was prepared for a different client. After the recession hit, the project was put on hold and the property was sold. The new owners liked the design prepared for the previous owners, so they decided to make only minor revisions. This house is all about the site, and two distinctive features drove the design. One is a large outcropping of ledge that bisects the narrow lot. The second is a carpet of moss and lichen between the ledge and road. The clients wanted a medium-sized traditional house that did not disturb the natural landscape. The design “inserted” a linear house along one property-line setback. The footprint is 24 feet wide and narrows to 17 feet where the house and ledge converge, producing a negligible impact on the site. The positioning of the home together with the sloping contours of the property placed the main living level “up in the trees”—an effect that is enhanced with thoughtfully placed windows that frame views into the woods. In spite of its wooded setting, the house is flooded with natural light. People are drawn to the screened porch and its tree-filtered sunlight. A contemporary, energy-efficient beach house. 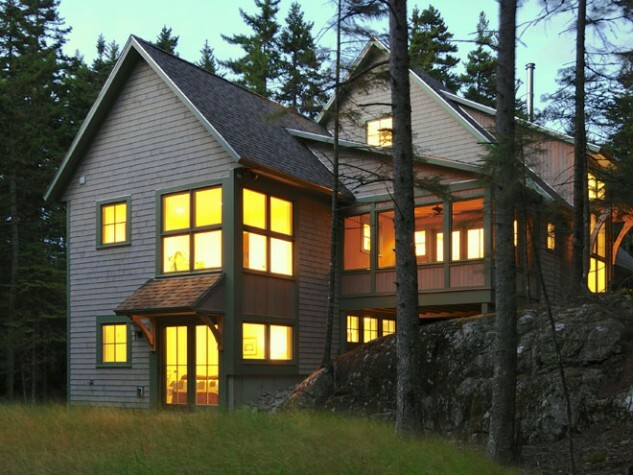 Located on the southern Maine coast, this 2,900-square-foot energy-efficient home complements its oceanside setting. The curve of the roof, the gentle arc of the kitchen island, and the undulating steel railings were inspired by the patterns of the coast, sand, and water—and by the gently curved shape of the owner’s favorite boatbuilding tool: the clinching iron. The landscaping and native plantings blend in with the surrounding natural beachfront vegetation, and the nestled house is unobtrusive when seen from one of the state’s most popular beaches. Still, the architects faced several challenges. Permitting requirements and a desire to preserve neighbors’ views left a very tight building envelope for the home. The clients wanted all the rooms to have dramatic views of the beach and ocean, but the size and location of windows had to be carefully balanced with privacy needs and energy efficiency. The homeowners asked for a modern home that did not feel unwelcoming and cold. 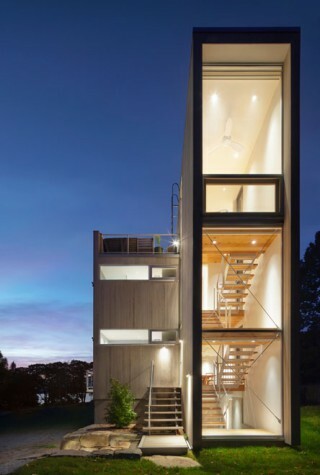 The entry sequence gently draws visitors into the building, and once inside, views to the beach and ocean unfold as one moves into the living areas. Carefully detailed cabinetry and natural-wood finishes in the open kitchen warm the space. Carefully integrated with the fireplace, similar cabinets in the living room provide seating, storage, and display space. When not in use, the television above the fireplace disappears behind sliding doors displaying art. Throughout the house, neutral-colored walls provide a perfect backdrop for the owners’ extensive art collection. With iconic views of the coastline from every room, this house is a tranquil retreat from the hectic beach traffic in the summer and the wind, cold, and snow during the winter. A complex residential program for eclectic collectors. Where does an architect go for ideas when the client wants a private library, an artist’s studio, guest quarters, work space for an antique-book business, a pizza oven, and a garage for both farm equipment and an Alfa Romeo convertible, all in one building situated on a hill? Van Dam Architecture and Design looked to Italian hill towns, where living quarters, shops, and work sheds merge into continuous forms that hug the topography, and where buildings are not discreet objects but assemblages constructed to meet needs over time. Their materials are a collage of stone, wood, metal, and beautiful flowering plants. The well-traveled clients understood the proposed concept immediately, and they took their time to carefully consider each aspect of the design. A stone piazza connects the older main house with a new one. A pergola with a large table and outdoor oven extends from the library door to a high stone wall with views of a fountain, ponds, and rugged hills. The building is surrounded by gardens that have been cultivated over time. Siting involved working with the owners and their gardeners to retain beautiful fern beds and trees while also creating space for strikingly original planted areas. The library is sumptuous, like the living room of a villa, but the space serves many functions. While the home looks like the set for an opera, the owners prefer rock-and-roll parties. A big television pops up from cabinets filled with antique boxes. Hand-printed art books and volumes on the history of cooking give way to large prints. One of the owners is the agent for the estate of Leonard Baskin. His collection of Baskin’s prints and bronzes are everywhere. Bold proportions, a clerestory, sparely detailed cabinets and lighting, and fire suppression and humidity controls make it resemble a modern museum. But all is brought to life by the brilliant choices of a nineteenth-century Italian fireplace and Tuscan festival–inspired chandeliers. A shingle-style summer residence on the granite shore of Somes Sound. The owners’ love of boating played a large part in the interior aesthetic of this understated shingle-style summer residence. The couple wanted to incorporate yacht-like quality and craftsmanship for the finish work, and skilled local craftsmen were employed. Solid mahogany beadboard wainscoting, custom mahogany windows and doors, and cherry book-matched veneer paneling were used throughout the house. The custom windows and doors were built with teak thresholds and brass tracks and finished on the exterior with a marine-quality paint. The double-hung windows operate with solid brass weights and chains similar to those used in fine historic buildings. The solid mahogany exterior doors lift and slide with a stacking feature to create an eight-foot unobstructed view of Somes Sound and Mount Desert Island. Several special design features were requested by the owner, including a second-floor study and loft with a built-in bed designed in the style of a sailor’s bunk, a granite fireplace built with locally quarried stone, and the extensive use of built-ins for storage and display. The entire concrete foundation was concealed behind a thick veneer of quarried granite, which helps to blend and anchor the building to the site and its natural landscaping. Covered balconies and terraces, the extensive use of custom, stacking glass doors, and strategic window placements connect the interior rooms to the unique setting and the water’s edge. Renovation of the former Baxter Library building. The VIA Agency is a nationally recognized advertising group. 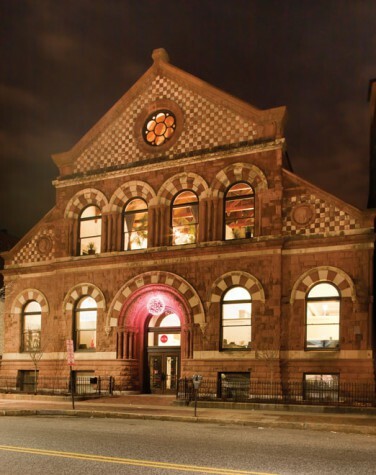 In 2010, VIA found itself with an opportunity to move their office spaces into the 22,000-square-foot former Baxter Library building on Congress Street. Scott Simons Architects was asked to re-purpose this unusual building for VIA, bringing a new look and feel to the space that would support their aspirations to be one of the most innovative, competitive agencies in the business. Their strategy was to create dynamic, modern office space within the beautiful building—contrasting new, high-tech materials with the historic fabric of the existing building. The designers intentionally left the original form and detail of the building as intact as possible. They inserted cellular polycarbonate wall and ceiling panels, glass and metal railings, perforated metal partitions, and wood sliding-door panels to define and enclose the new office and studio spaces, while carefully coordinating the mechanical, electrical, and IT needs of the modern office and production studios to be as invisible as possible within the historic details of the existing structure. The former reading room in the center of the library was transformed into an exciting new space that includes views into the video-editing studio, the digital “knowledge center,” and the “Forum,” which features stepped seating for audio-visual presentations. 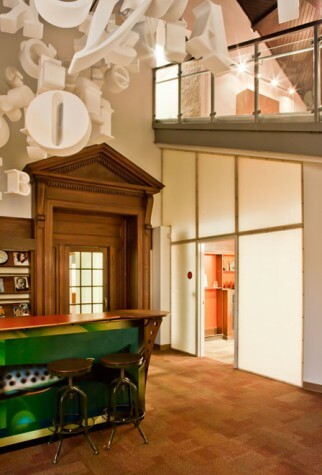 Because the building is on the National Register of Historic Places, the architects were required to work with the National Historic Preservation office in Washington, D.C., to make sure that the interior-design changes met federal guidelines. The project received historic preservation tax credits, LEED Silver certification, and approval by the National Parks Service. 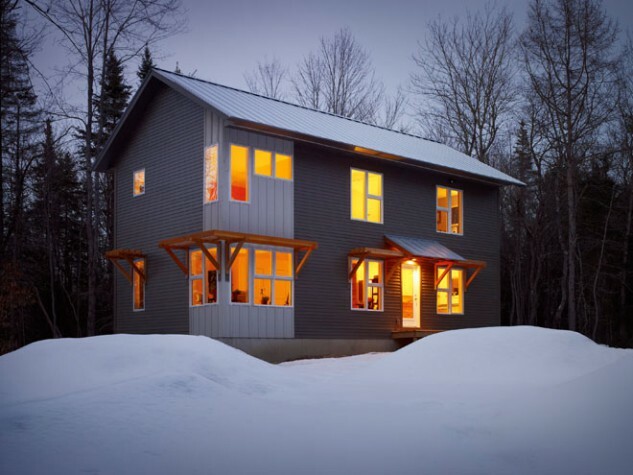 A new house built on an existing footprint allows year-round use. The existing camp was quite charming on the inside but kind of dull on the outside, and it could not be upgraded to a year-round home because it had been built for summer use only and had no real foundation. Because the site was extremely restricted, the local planning board allowed the owners to build a new house on the existing footprint, even though that footprint was close to the water. While expanding the house by the allowed 30 percent, the architects attempted to keep the intimate cottage-sized scale of the original building. They also worked to maximize the west-facing views over the bay that make the site so spectacular. Beyond the practical considerations of fitting all the required spaces into the existing footprint and staying under the imposed height limitation, the architects also wanted to respect the scale of the surrounding buildings. They created a house that appears as a number of interlocking volumes—an assemblage of smaller pieces that doesn’t visually seem bigger than its neighbors. A light-filled home’s site alignment and exterior sunshades maximize both winter sunshine and summertime shade. David Matero, along with a contractor and a realtor, approached the owner of the Lulwe Ridge development in Brunswick with the concept of designing, marketing, and constructing energy-efficient homes on his empty lots. The team’s give-and-take design and pricing process focused on a forward-thinking house that would incorporate durable, low-maintenance materials, energy efficiency, and a properly thought-out design that considers the way families live without making unrealistic demands on the occupants. A primary concern was how light would benefit the occupants. In the final design, light splashes the interior from high openings, and windows pushed to the corners bounce light farther into the interior spaces. 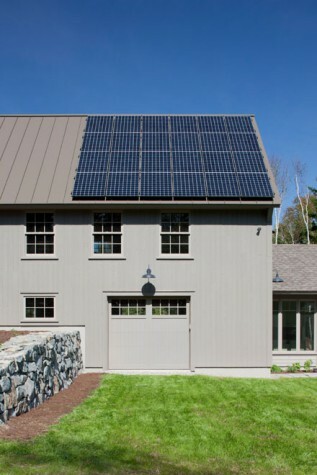 Solar gain in the winter complements the R-38 insulated walls and R-60 roof, and a deep roof overhang and Douglas-fir sunshades block the summer sun and help keep the house cool in the summer. Designed to adapt as a family’s needs evolve, additions such as first-floor master-bedroom suite, screened porch, and a breezeway with garage have been pre-planned into the design so they will require only minor changes to the existing construction. Even the loft could easily be converted to a bedroom if necessary. A great deal of consideration was given to reducing waste and utilizing local products. The walls were panelized, and the roofs and trusses are purposely simple in design. The yellow-birch floors are made in Maine, and the recycled barn board used for the accent wall came from a barn down the road. This “Lean Too” house is the first completed prototype, and the team hopes there will be many more homes built and adapted to their particular landscape and surroundings. This guesthouse for visiting family members and friends can be enjoyed all year long. At the end of a peninsula in Penobscot Bay was a family compound with turn-of-the-century buildings. The main house was not livable in winter, and the growing family who gathered during the summer needed additional space. The owners asked the architects to evaluate the existing buildings and site to determine how best to accommodate their needs. The recommendation: to construct a guesthouse and two garage and storage buildings to be located nearby. Although off to the side, their site was still in view of the main house, leaving room for lawn in front and allowing views down to the water. To take full advantage of the view, an open, full-length covered porch was added to the guesthouse. The rooms inside all share access to the porch and unobstructed sightlines, giving the house a casual indoor-outdoor flow for summer use. A single large room contains the kitchen at one end and a large stone fireplace at the other. The three bedrooms are all upstairs. Extending off the back, an ell contains a game room downstairs and a Pilates exercise room above. The cottage provides lots of space for summer guests, and it can be heated in the winter. The exterior finishes were meant to weather over time to blend into the natural landscape and not compete visually with the main house. For these reasons, cedar shingles were chosen for the walls and roof, and the white trim mirrors the color of the main house. The interior was meant to be casual and durable, so beaded paneling was used for the walls and ceiling. The kitchen was designed to address the owner’s desire for an “unfitted” look, with custom cabinets, an old slate sink, and a large range. The house is part guesthouse, with touches of lodge and clubhouse. A new full-time residence for an active couple who have owned the property since the early 1970s. After visiting and camping on their property, which stretches along the eastern side of Penobscot Bay, the couple had high expectations for their new home. Now their new driveway swings shoreward over some intervening wooded ledges to a small, level site carved out of a ledge. Despite the size of their new house, its low profile, stained cedar-shingle siding, and dark roof shingles, as well as the careful siting and preservation of existing trees, make it inconspicuous and nearly invisible from the harbor. The house’s two largest roofs face due south, allowing for solar hot-water panels and photovoltaic arrays. The floor plan runs north and south to give the interior spaces maximum east-facing water views through a screen of pines, spruces, and birches. The first-floor layout includes the master bedroom, the wife’s study, the library, dining room, living room, and screened porch, all connected by an outside deck that terminates in a low stone wall. (Most of the stone walls on the property were built from the blasted ledge.) From the kitchen, the owners can look through the dining room to the views beyond, and a heated connector links the kitchen to the pantry, utility entrance, laundry, and a combination barn and garage. The kitchen island stands exactly where a large maple tree, used for its countertop, once stood. The second floor has three guest rooms, a sitting area for family and friends, an exercise room, and an octagonal office with panoramic views. In addition to the solar hot water and photovoltaic array, two geothermal wells provide the rest of the home’s heating needs. The well-insulated house is designed to be virtually energy independent. A bare-stud renovation and addition integrates sustainable, low-energy systems and a comfortable mix of a traditional New England aesthetics with modern design. 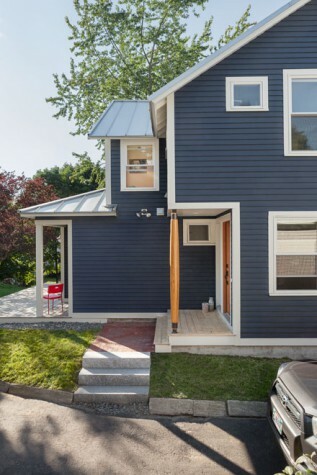 The project started with a dilapidated two-family house in South Portland that the clients purchased because of its location. Caleb Johnson Architects was enlisted to transform the building into a home. Their instructions: create a green structure with low energy demands that incorporates modern design within the context of a New England–style building and neighborhood. Caleb Johnson’s approach was to start with a new floor plan that required all bearing walls to be removed and replaced with Maine-hemlock beams. These beams and their structural connections became an expressive part of the design and set the tone for the rest of the house. After the structure was put back together, a blower-door test was performed by Horizon Residential Energy Services, and its air-tightness rating was the second-best the company had tested, in spite of the complicated addition and renovation process. The project features Maine materials and craftsmanship throughout—notably in the custom-turned, one-off column made of reclaimed cypress near the front entry, the bold cabinetry, reclaimed antique doors, and Maine-ash flooring. Acting as both the architect and general contractor allowed Johnson and his team to affordably manage the execution of the home’s many custom features. Island Cove Building & Development Inc.